Lords Mobile: What are the Rules for the Kingdom Clash? Kingdom clash is the largest global event in the game. During the event, all kingdom will engage in battle! 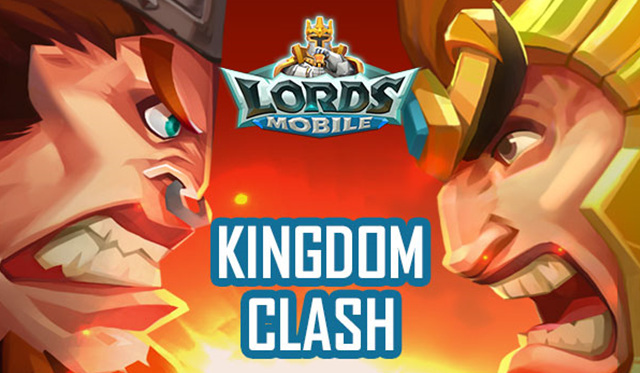 Unlike the Clash for Throne, which is primarily aimed at fighting your own Kingdom residents, the Kingdom clash concept is its mirror image: you should burn players' cities from other Kingdoms to score points. It's a war game. Fight for glory! Open portals to other kingdoms to attack enemy players' cities. You cannot get points by attacking players from your own kingdom. Kingdom Clash is only available in Kingdoms that are more than 90 days old. This event lasts for 1 day. Kingdoms will face each other in a 1 vs 1 battle. The system will pair Kingdoms based on previous KvK results. If there is an odd number of eligible Kingdoms, the unpaired Kingdom will not participate in Kingdom Clash. You can earn Solo, Guild, and Kingdom points by occupying Wonders, killing rival soldiers, destroying rival traps, and gathering resources and hunting monsters in rival Kingdoms. Players cannot attack or reinforce guild members that are from a different Kingdom or participate in their rallies.